Grab this handy master cable to recharge 99.9% of the smartphones and gadgets currently available. 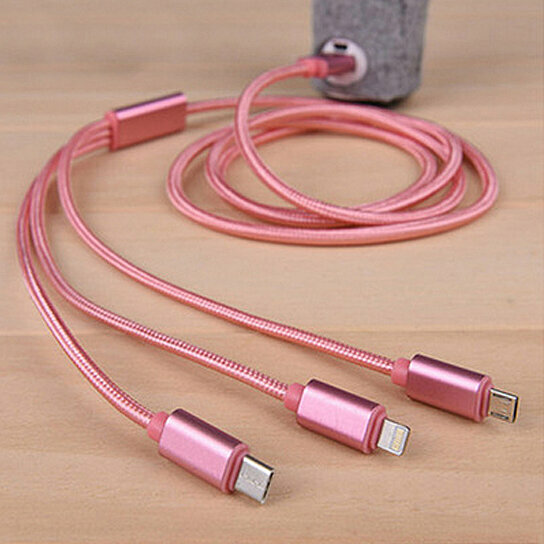 This all-in-one cable features an 8-pin Lightning cable for Apple devices, micro USB for Samsung and Android devices, and a Type C cable for the latest devices...No need to carry a different cable for every device! Made from steel and nylon fibers, it's tough, hardened by an inner core full of multi-threaded copper and fiber, giving you quick charging capabilities. The overall length of the cable is approximately 3 feet. The charging end has a standard USB type plug that can go into any USB power port.